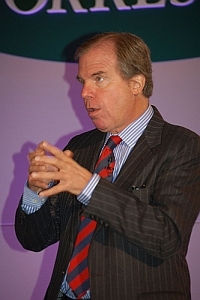 Do you wonder what Nicholas Negroponte really says about the goals of One Laptop Per Child in his speeches? Would you want to read what he told the Forrester's Consumer Forum about the role of teachers in education? Or maybe what Walter Bender might say (or not) about the real cost of a Children's Machine XO at Ars Electroinica? Or what about Michail Bletsas' ideas on shared personal computers as told to the PARC Forum? Better yet, Christopher Blizzard's keynote speech at the Red Hat Developer's Forum? And maybe you, like I, are more a visual than auditory learner, with type transferring more understanding than voice. Then may I have the honor to present to you, via the micro-jobbers at Amazon's Mechanical Turk, and a few weeks of code and upload, a special Christmas present: One Laptop Per Child Talks. OLPC Talks is a forum to review presentations on the One Laptop Per Child Children's Machine XO by OLPC's leadership, including MIT Media Lab co-founder Nicholas Negroponte, transcribed for non-commercial study and investigation, commentary and criticism. Over time, we'll be adding additional presentations, speeches, talks by the OLPC leadership as they become available. If you have your own recordings of on-the-record OLPC commentary, please pass along a link. We'll be happy to transcribe it to the best of our abilities, and its inclusion will deepen the understanding and expand the debate around One Laptop Per Child and its noble goals. Hey, this is super. It will be a resource for people who want to follow olpc. How do you guys find enough time to get so much done?